Within Teamwork Projects, you can upload your own custom CSS to affect how your Teamwork Projects site looks. CSS (Custom Style Sheets) is used to define styles for your web pages, including the design, layout and variations in display for different devices and screen sizes. Note: This feature is only available on the Premium plan and above. To enable CSS, click your profile icon in the top right corner of your site, and select Settings from the dropdown menu. Note: Only the site owner or site admins can enable integrations on a site level. In the Settings area, go to the Integrations tab. In this section, you will see an option for Custom Styles. 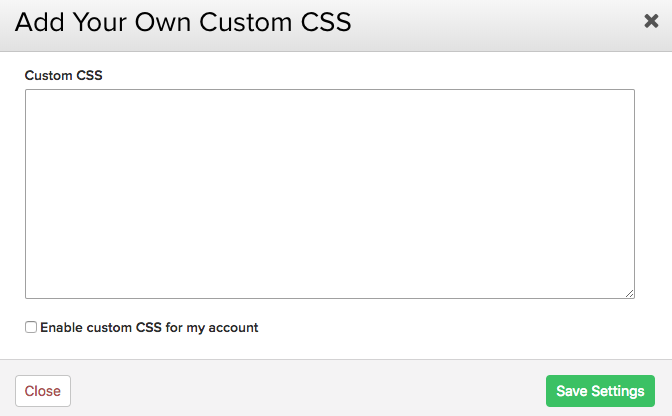 When you click Manage CSS, a modal will open where you can select the Enable custom CSS for my account checkbox at the bottom of the modal. You can then paste your code into the text area. Select Save Settings to apply your custom style sheet.